I'm really trying to jump the gun on this fall thing. I got excited this week, and tried to go buy candy corn (hint: they aren't selling it yet), started pinning fall and halloween stuff like crazy, and kept trying to dress like it's sixty degrees out instead of eighty. Case in point: this outfit. I originally had boots on and was sweating to death. Note to self: next time, check the calendar! Fall doesn't officially start until the 23rd. 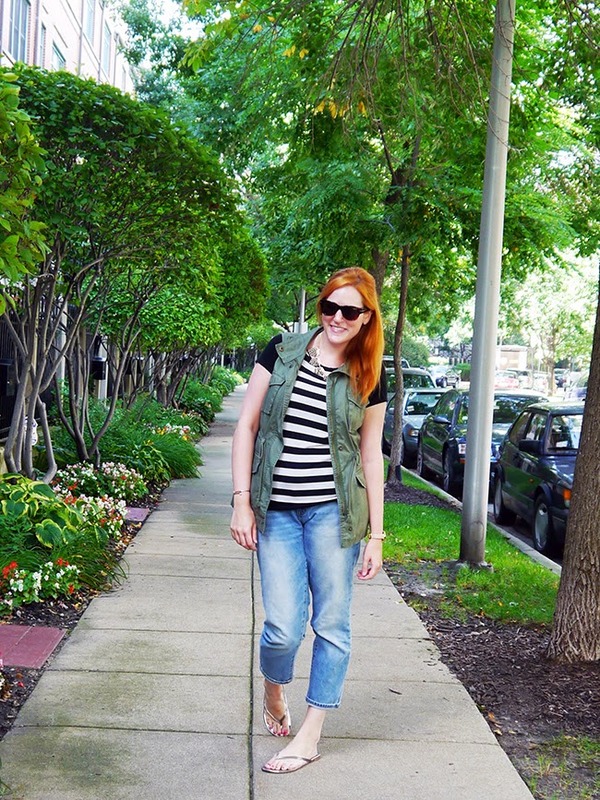 Linking up with Monday Bloom and Friday Fab Favorites. Hehe I know but there is so much fun fall clothing out already--its making me ready! :) You look adorable--love the vest!! This is going to look great with boots when it's cool enough to wear them though! I'm so ready for fall too. It's 90 degrees here today, but I want nothing more than to be wearing jeans and sweaters. 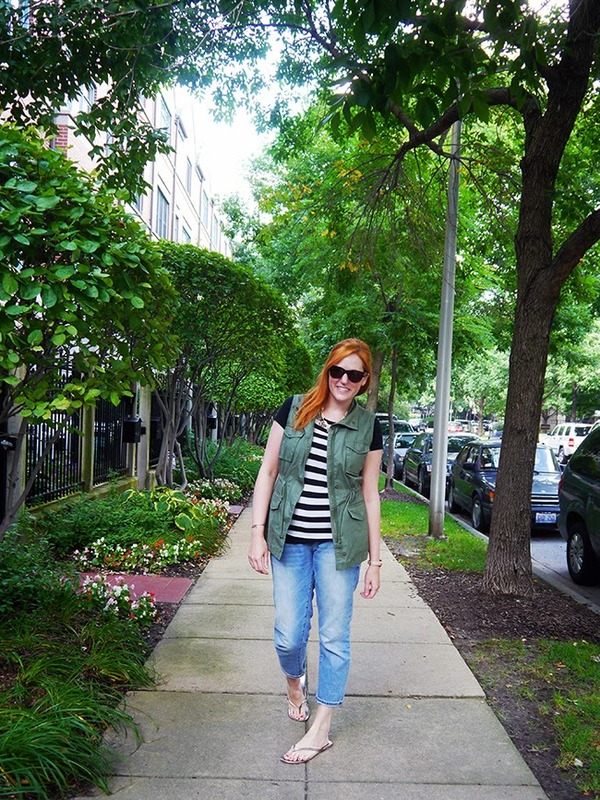 Love the jeans with the cute cargo vest. Like how you dressed it up with the jewels. I am ready for fall too, although it may be a little while here in Charlotte! i love black and white stripes w/ a cargo vest!! SO cute and they are totally selling candy corn at my Walmart... so theres that.. Happy Friday! Haha, I think Fall will be here before we know it. Even though our hottest days have been end of August and a few days in September. It goes up and down like crazy. Love this look though! Great combination! I think jumping the gun is just in our genes as Chicagoans :) If we only get precious few weeks for warm summer clothes, then I'm definitely going to be a cold weather clothes lover... but I'm cool with our temps never going below 40. Love your necklace!! Nice vest! 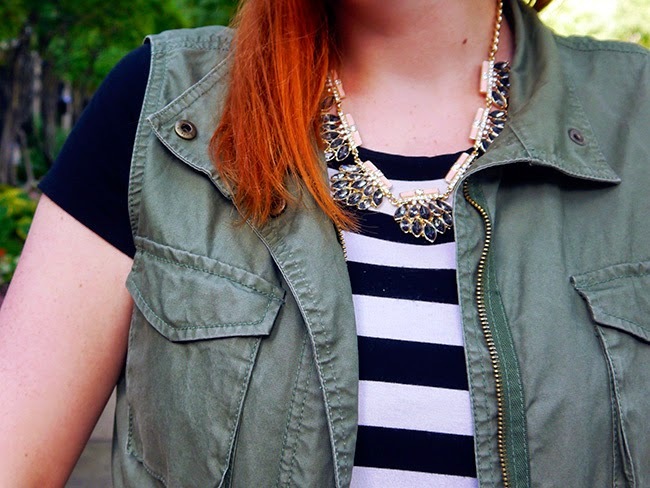 It's perfect for fall layering!